Are you an establised professional who wants to make positive changes in your community and the world? Our clubmembers are dedicated people who share a passion for community service and friendship. Becoming a Rotarian connects you with a diverse group who share your drive to give back. We meet Wednesday mornings at 7:00 a.m. at Kenny Blanek's Village Cafe located at 2100 W. Beauregard, San Angelo, TX 76904. Please come join us. San Angelo Sunrise President Amber McNew was our speaker this morning, sharing her passion to combat Human Trafficking. Jan Lentz has developed a specialty for treating combat PTSD by turning her love of pottery making into a therapeutic tool for veterans. The Sunrise Rotary met at John & Dianalee Jones house to install the new officers for the 2018-19 fiscal year. Melody Jeter from the Children’s Advocacy Center (CAC) was our guest speaker this morning. With April being Child Abuse Awareness Month it gave Ms. Jeter an opportunity to share information about the CAC. Lettitia McPherson and her son Rodney were our guest speakers today. Lettitia is the Executive Director of the ARC of San Angelo. The ARC helps people with disabilities to be included in their communities. Each year our outgoing Club President makes their recommendations of charities they wish to donate money towards, while keeping the focus of their Rotary International in mind. Charities chosen by Mike Selander, San Angelo Sunrise President 2017-18, were Doctors Without Borders, Shelterbox, Ezra Vision Ministries and Water For All International. Our guest speakers this morning are Jason Mendiola and Lorraine Haricombe, Vice Provost and Director of University of Texas Libraries. They spoke about the UT Library system and how it is meeting the needs of students and faculty in the 21st century. Diann Bayes was our guest speaker this morning from the San Angelo Convention & Visitors Bureau. Diann is the Vice President of the Convention and Visitors Bureau at the Chamber of Commerce here in San Angelo. She comes to San Angelo from Austin with over 20 years of experience. She spoke to us this morning about the importance of visitors to our community. Justin, Sabre, & Keith were the camp attendees this year from the San Angelo Sunrise Rotary Club. While Sabre & Keith were first –time attendees, Justin returned this year to be a team leader. Amanda Hodges with the San Angelo Chamber of Commerce was our speaker this morning. She was recently promoted to Director of Membership Relations. Russell Pehl with Helping Hands (HH) was our guest speaker this morning. Helping Hands is a program of Galilee Community Development Center which was formerly known as Christmas in April. Randy LeCompte, Deputy Executive Director of the Concho Valley Workforce Development Board, was our speaker this morning. Randy LeCompte is a graduate of West Point and is a veteran of the U.S. Army of 30 years, retiring with the rank of Colonel. The fifth biennial Texas Trails and Active Transportation Conference is headed back to Austin in May, and it's your time to shine! The 2019 Rotary Peace Fellowship application is now available. Advance peace around the world by publicizing this incredible opportunity! Take action to create change locally and globally. The world's first service club, the Rotary Club of Chicago, Illinois, USA, was formed on 23 February 1905 by Paul P Harris, an attorney who wished to recapture in a professional club the same friendly spirit he had felt in the small towns of his youth. 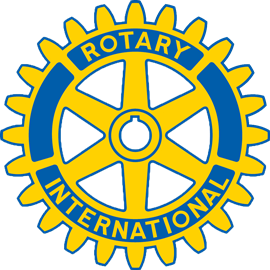 The name "Rotary" derived from the early practice of rotating meetings amoung members' offices.